I know this post is two days late, but we have been busy all weekend and I have today off work so I knew I’d catch up! On Tuesday one of my colleagues died, the manager in charge of my very big, important, main-release-just-closed project in fact. He was just 36 and had a massive brain haemmorrhage. Shocking, tragic, still really hard to grasp. Also on Tuesday we heard that baby Isla was back in hospital for more surgery, as she had a big build-up of fluid around her heart and in her lungs. Wednesday and Thursday were quiet days as I digested all the trauma of Tuesday. Friday evening A had to work so I arranged to see my friend Mrs Jarge, who I haven’t seen for more than 6 months. We have that kind of friendship where it can go months and months but as soon as we meet up there are a million things to say. Mrs Jarge isn’t doing too well as she is very slowly recovering from a massive and serious car accident. But I made her and her 10 year old son laugh by producing their xmas presents…still wrapped up in xmas paper! Saturday evening we looked after Gethin while David and Sam were at a wedding. He was cute as ever, but didn’t want to go to bed as he’d had such a disrupted day. Sunday evening we heard that Isla had been allowed home from hospital again – the chest drain had been successful and she is lots better. I’m still doing bits and pieces with the forest path stole, but it hasn’t made much progress this week as it requires concentration and there has been precious little of that to spare. I have also made some progress on my blue bedsocks, but they suffered a setback when I attempted to turn a heel after a drink or two and dropped a stitch. Now usually picking up a stitch is no big deal, but with this fluffy yarn it is a nightmare…and in my slightly beery state I managed to ladder it further than necessary. Needless to say, when I looked again in daylight the next day, it took seconds to fix. This coming week…not a lot going on, I hope. Work is still busy, but not manically so, and we have no social plans until the weekend, when we’re going to Gethin’s first birthday party. I know, can you believe it?! One already! 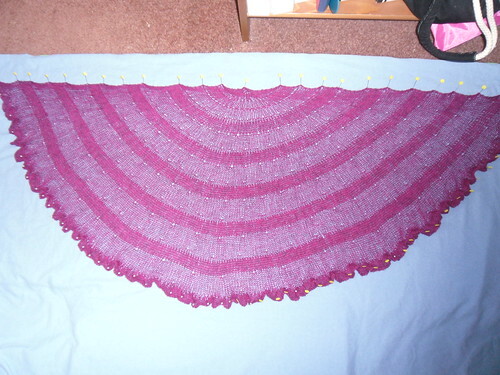 This entry was posted on June 27, 2011 at 9:36 am and is filed under Baby, knitting, Work. You can follow any responses to this entry through the RSS 2.0 feed. You can leave a response, or trackback from your own site. That was a busy week. Sorry there was so much trauma–that is even shocking over the internet distance. Love the shawl, thanks for the compliments!